The most common type of traffic collisions are car accidents. Commonly referred to a motor vehicle accidents (MVA), more people are fatally killed in car accidents than have died in American wars in the past century. Nevada has it fair share of car accidents, with the highest concentration occurring in Las Vegas. Two types of accidents that can be particularly serious are DUIs and pedestrian accidents. DUIs account for a large part of car crash fatalities in Nevada. It is not uncommon for a drunk driver to leave the scene of an accident, which results in even more serious charges resulting from the crash. Drunk drivers can cause direct property damage and injuries to those involved in the crash, but they may also cause additional destruction. This may include damage to power poles, other parked vehicles, construction signs, and other objects in the driver’s path. Nevada law enforcement and pedestrians are also at risk of becoming victims of a drunk driving accident. Pedestrian accidents that involve cars can cause serious, crippling injuries or even death. In fact, Nevada has one of the highest incidents of pedestrian accidents because of the large volume of sidewalk traffic in its major cities. Nevada law mandates that all drivers maintain a minimum of $15,000 in liability insurance coverage. Unfortunately, this amount is unlikely to cover medical bill expenses, lost wages, and even pain and suffering as a result of a Nevada car accident. (The good news is the legislature recently increased the minimums to $25,000, to go into effect in 2018.) Because, like many other states, uninsured/underinsured motorist coverage is not required under Nevada law, a car accident victim’s best opportunity to obtain damages caused by an accident due to another’s negligence is to pursue a personal injury claim in court. The state of Nevada distinguishes between minor and adult drivers in the eyes of the law. Specifically, parents are held liable for the acts of their children. When an individual has already been involved in one accident and injured, and then is a victim of a second accident shortly thereafter, there are specific legal doctrines that are followed. Nevada law follows a case known as Klietz v. Raskin. Under this ruling, the law states when an accident victim has more than one accident in close proximity to one another, if the injuries are not distinguishable from the multiple incidents, the burden shifts to the defendant to calculate damages. Normally, it is an accident victim’s burden to calculate damages owed in a personal injury lawsuit. 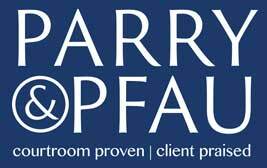 The skilled and experienced attorneys at Parry & Pfau have been representing car accident victims across Nevada for years and can provide solid legal guidance in your case. If you or someone you know has been injured as the result of an auto accident, or has suffered any other type of personal injury due to the negligence of another, call toll free (702) 879-9555 or click here today to schedule your initial consultation. Newer PostIs it Legal to Download Youtube Videos?